Day 2 of the 2016 Outdoor Heptagonal Championships is underway. The decathlon resumed with the high hurdles. Day 1 leader Austin Jamerson has extended his overall lead by producing the fastest hurdle time of the day – 14.70. He and Dartmouth’s Nico Robinson – in position 2 after Day 1 – are the only athletes to run sub-15 seconds in the event. Robinson’s time was 14.81. After six events, Jamerson leads Robinson by 153 points – 4776 to 4623. Harvard’s Mark Hill sits in third with 4405 points. Robinson made up some ground on Jamerson in the discus. Robinson threw 118-10 for the best mark of the event, picking up 588 points. Hill also made up some ground as he finished in second place with 115-01 for 565 points. Jamerson was third with 114-01 for 559 points, but continues to hold the overall lead (5335 points) against Robinson (5221) and Hill (4970). The heptathlon concluded their first event of Day 2 – the long jump. Harvard’s Allison Morrison was the top jumper with a distance of 19-01 1/4. Heptathlon leader Taylor Morgan of Princeton had the second best jump of 18-07 3/4. Morgan continues to lead the overall event with 4058 points while defending champion Madison Hansen of Harvard sits in second place with 4002 points. Morrison moved up to third with 3767 points. Top seed and the 2013 champion Rob Robbins of Cornell sat in the lead of the men’s javelin final with a season’s best distance of 242-08 – four inches shy of the meet record of 243-00 set by Harvard’s Chris Clever. Unfortunately, Robbins could not best it on his final throws of the competition, but he did get a second Heps title with that 242-08 distance – the second best in meet history. Defending champion Jacob Shippee of Dartmouth finished in second place with a distance of 218-04, a mark that bested his 2015 performance by over 10 feet. Now, you can follow Day 2 action through webstreaming. The Ivy League Digital Network will begin their broadcast at 11:45am with announcers Bill Spaulding, Robert Johnson, and Dave Hunter. To watch the meet, you will need to subscribe a Day Pass through this link: http://www.ivyleaguedigitalnetwork.com/packages, choose their school (under “School Packages”) and select “School Day Pass.” Their subscription will be good for 24 hours from the time they finalize the purchase. 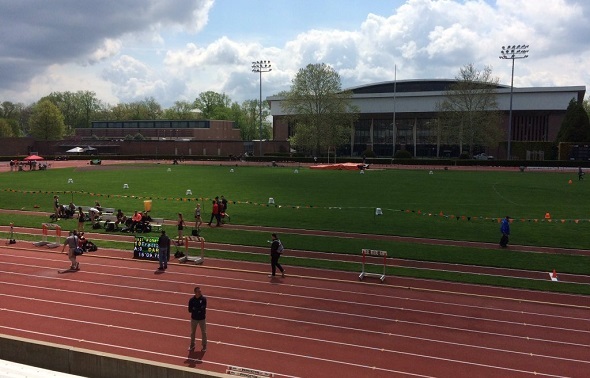 Flotrack will be simulcasting the meet from ILDN, but they will be providing additional content from Day 1 competition, including interviews with Day 1 winners and broadcasting select events. To sign up for this, you will need to subscribe for FlotrackPro. Better hurry up – the next events will be starting at noon and will be non-stop until after 5pm. This entry was posted on Sunday, May 8th, 2016 at 10:19 am. It is filed under Heps Champs, Spotlight. You can follow any responses to this entry through the RSS 2.0 feed.